09/04/2001 : Wielding their rackets as swords - like the Samurai in the ancient Japanese empire - Candra Wijaya and Sigit Budiarto yesterday enjoyed a taste of history after their stunning victory in the men's doubles at the Yonex Japan Open. A few months after Sydney, the two friends were back together for a first win in the Dutch Open. 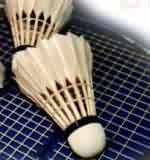 But the road to their set target – the world championships – led to the Japan Open. And yesterday in Tokyo, Budiarto and Wijaya were just unstoppable. Their opponents of the day were Lars Paaske and Martin Lundgaard Hansen, Denmark's only chance of a title, as all of the Danish team were eliminated before the semi-finals of each event. Yet the suspense didn’t last long, as the Indonesians took over very early in the match. “We tried to put as much pressure as we could and take the attack as soon as possible,” said a delighted Budiarto, holding tight this gold medal as a strong symbol. After winning 15/7 in the first game, the Indonesians kept up the pressure, pushing Lundgaard Hansen to make many unusual mistakes. “We knew that the key to this match was the mid-court section. Who ever could take the attack first would win the match,” said Hoyer, reincarnated as a men’s doubles coach. “Unfortunately, no matter what Lars and Martin tried on the first three strokes, the Indonesians never lifted up the shuttle. In these conditions, there was no way they could win,” added Hoyer. Overall, the final was very disappointing. The only moments of suspense occurred when the Danes were trailing 6/14 and saved 7 match points, playing once again at their best level. The net helped the Danes to get back on track, with six of their shuttles landing just other side of the net band to make it last a little longer. Yet the score difference was too wide and the Indonesians finished 15/11 before falling in each other’s arms. “This victory is a symbol for me, it means that we are back in the top pairs in the world, and now we want to conquer the world gold medal again” said Sigit. The Indonesians were thrilled by another unexpected victory as Bambang Suprianto and Minarti Timur, a newly formed pair, won the mixed doubles event. Playing with different partners until now (Timur was a silver medallist in Sydney with Tri Kusharyanto), the Indonesians had a thrill in the final when they missed few match points in the second game against Liu Yong and Cheng Jiao of China. Leading 15/6 – 14/8, Suprianto started to miss easy shots as the pressure was building up. The Chinese got back into the game, to level up 14/14 finally gaining the second game 17/14. But the suspense was taken away in the third set when Suprianto’s high smashes and Timur’s net play made a clear difference. They wrapped it up 15/6 for a first Indonesian win in the mixed double for quite a while in a Grand Prix event. One who has had a victory not too long ago is Roslin Hashim of Malaysia. After his semi-final at the All England and his win in Basel a couple of weeks ago, Hashim was rather confident before the final against a young and very talented Lee Hyun Il. But the Korean couldn''t cope with the pressure, unless it was Hashim’s game that made him lose part of his skills. “I also tried to hide my shots until the very last minute, to prevent him from anticipating too much, which he does brilliantly,” added Hashim. The second game was indeed controlled by the 25-year-old from Kuala Lumpur, who won finally 15/11 – 15/6. “I still consider myself as an underdog, and I will keep on thinking this way for the world championships in Seville,” said Hashim, whose future looks bright. First because he now holds a key position to be well seeded in Spain, but also because he is now fully supported both by his club (Nusa Mashuri), and his National Federation. “I feel good about the new president of the BAM, as he understands what is best for our country. Having my coach here helped me a lot in my success,” said Hashim, who was referring to Jalani Sidek. Hashim said he would now put the US$14,400 prize money in the bank “for important needs later and to help my parents who have been very supportive” and that he would get back to training after a couple of days of rest. The women's events were an all Chinese affair, as usual. Zhou Mi showed she mastered both power and touch against friend and training partner Gong Ruina, to beat her 11/8 – 11/0 in just 25 minutes. “I know her so well that knew how to play – but I am not going to tell you” she said ironically to the journalists after her victory. Their compatriots Gao Ling and Huang Sui beat the odds and opponents Huang/Yang who have been considered as the new Chinese women's doubles leaders after the retirement of Ge Fei and Gu Jun. Yet they were outplayed by an inspired pair. Next challenge for Gao and Huang? “Win our next match,” said Gao Ling in a laugh, whose humility is only comparable to her sense of humour and – most of all – a great talent she showed once more in Tokyo this week, both in the women's doubles and mixed doubles.